It’s going to be a long and difficult haul to regain full use of my knee and the leg it’s attached to following my recent knee replacement. While the pain is greatly improved, it’s going to be around for awhile. Along with a mind-muddling mix of diabetes, neuropathy and pain meds. And the ever-changing array of medieval torture devices and exercises my surgeon and therapists have in store. So if I have to miss a few days here and there, please accept my apologies in advance. But I’ll do my best to be here for you every morning. And keep you up to date on all the latest bike news and advocacy. 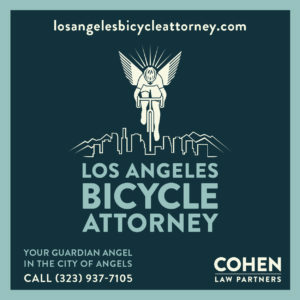 Let’s start with some difficult news from Eli Akira Kaufman, the new executive director of the Los Angeles County Bicycle Coalition. Two months ago, I joined LACBC as Executive Director because I believe that everybody has the right to travel our streets safely. One thing that was clear to me from my years as a member of the Coalition and rolling with friends and family on the LA River Ride was how tight knit the community is – especially the LACBC staff. Through all the twists and turns, this team has worked tirelessly to grow LACBC into an organization of which we can all be proud. As a small but powerful team, they have done an incredible job working to make the entire County of Los Angeles a safer region for people on bikes, on foot, and in automobiles. When I was hired, the organization was already in the process of evaluating our overall financial health. Last month, it became clear that LACBC could no longer support the status quo with our current budget. As a result, we have had to make difficult decisions, including having to move one staffer to a part-time role as two other team members departed to pursue other opportunities. These changes are as heartbreaking as they are challenging, because Dana, Lyndsey, and Cesar are family to us. Their contributions can not be overstated and their daily passion, creativity and thoughtfulness will be deeply missed. With this in mind, I wanted to make sure that each of them had the opportunity to speak to our larger LACBC family, as we’ve all benefited from the impact they have made – and will continue to make – in our community. Sources tell me the problems stem, at least in part, from the long leadership vacuum caused by former LACBC ED Erik Jansen when he stepped down after just seven months on the job. Not to mention a troubling degree of disengagement while he was still on the job. Which means it’s been nearly two years since the coalition has seen effective leadership. And that’s taken a serious toll on their finances. If you’re wondering what you can do to help, the answer is simple. 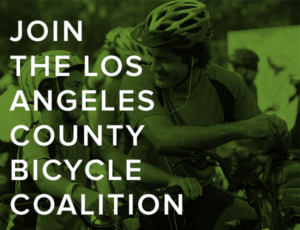 If you’re an LACBC member, renew your membership. If not, join today. Or make a contribution. A big one, if you can. 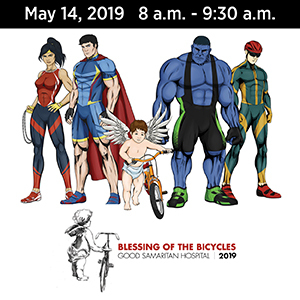 All to help LA County’s leading bike advocacy group get back to fighting for your rights and safety on the streets, and in the civic offices of the county’s many communities. I’m on a tight budget myself these days, as I await an avalanche of medical bills. But I’ll be renewing my LACBC membership early to help out. Unfortunately, it’s also the most I can do right now. Los Angeles is about to be flooded with scooters and dockless bikes, as the city’s one-year pilot program is ready for kickoff. DTLA is getting new scooter and bikeshare parking zones similar to the ones in Santa Monica; unfortunately, they’re on the sidewalk instead of the street. However, the city’s new data sharing requirement means that LA officials will now be tracking every trip you take on them, everywhere you go. Politico calls it the next data privacy fight. So depending on where you’re going and why, you might want to choose another form of transportation if your privacy matters to you. Meanwhile, City Lab says maybe the solution to dockless bikeshare and e-scooters is to bring back the docks. Big news from LA County, where county supervisors approved a motion by 1st District Supervisor Hilda Solis to consider adding protective barriers to new and existing bike lanes in unincorporated areas. Which doesn’t, despite breathless proclamations from some quarters, mean the county will suddenly start sprouting protected bike lanes. But assuming it goes beyond just studying, it could be a big step in the right direction. Is it just me, or does new e-scooter provider Wheels not have a clue who their target market is? Unbelievable. An Oakland man is living proof that you can chase a woman down with your car, knock her off her bike, steal her cellphone, and threaten her with a gun. And not spend a single day behind bars. A Cleveland woman with an extensive criminal record will spend the next five years behind bars after intentionally running down a man as he was riding his bicycle; she accused him of robbing her, though police said they knew each other. A DC motorist is under arrest after throwing a beer at a bike rider from a moving car — then flashing a knife at the victim when he came back for a cellphone, which he had inconveniently dropped while flinging his brew. Caught on video: A Virginia driver tries to intentionally run down a bicyclist, even following him onto the wrong side of the road as the rider attempted to get out of his way. And no surprise here, as a new study shows many drivers see bike riders as less than fully human, and that dehumanization makes them likely to act aggressively towards people on two wheels as a result. Always inspect your bike before a ride. Bike people aren’t always the good guys. The LAPD is looking for a man who rode his bike up to a Reseda home, and snatched a teacup Yorkie off the porch before riding off. Bad news for long-time Sherman Oaks bike shop The Bike Connection, which suffered an attic fire Friday night; no word on how much damage the fire caused the 40-year old shop. Pasadena has reconfigured the popular Rose Bowl loop, forcing the hundreds of bicyclists who turn out for an informal, twice weekly ride to slow at a key intersection; riders say it just increases the risk for everyone. Forty-four palm trees could stand in the way of a Long Beach complete streets project, including new sidewalks and bike lanes. Seriously, what could possibly go wrong? An Orange County state legislator has introduced a bill that would add two speed-limit free lanes to the I-5 and State Route 99, allowing drivers to go as fast as they damn well please. Bird gives Thousand Oaks exactly that, telling the city to forget about those plans to bring scooters to its streets. Kindhearted Fresno cops pitched in to buy a boy a new bike when they were unable find the one he got for his birthday after it was stolen. After a San Francisco woman was killed riding her bike, over 100 people turned out to form a people-protected bike lane to call for more permanent, non-human protection. The city responded right away by extending the street’s protected bike lane, though only by two blocks. And needless to say, the driver who caused the crash by dooring her, forcing her into the path of a truck, won’t face charges. San Francisco safety advocates say the city’s Vision Zero program is doomed to fail without improved metrics, better transit, and rock-solid commitments. The same could be said for its bigger state mate to the south. And has been. Sacramento plans a crackdown on illegally parked dockless Jump ebikes and e-scooters; the city is the first where Jump bikes are more popular than parent company Uber. The annual North American Handmade Bicycle Show opened in Sacramento, both Pink Bike and Cycling Tips hit the highlights. The Grateful Dead’s Bob Weir is one of us. Or used to be, anyway. A bipartisan bill would restore the commuter bike benefits that were removed under the Trump tax plan, and extend it to bikeshare and ebike users. Your next bike could be lighter and stiffer than aluminum and cheaper than carbon fiber. And made from the same stuff they make matches out of. An Arizona paper takes a deep dive into the Uber self-driver car crash that killed Elaine Herzberg as she rode her bike across a Tempe street, in an effort to determine who’s really at fault. Unfortunately, they conclude that no one will be held accountable for her death. After riding from her home to the state capital earlier this year, a New Mexico lawmaker wants to make it the nation’s most popular state for bikepacking. Maybe they don’t want us there. A new tourism video for South Dakota’s Black Hills shows hikers, hunters, fishermen, equestrians, cars, trucks and canoes. Bicycles, not so much. Thanks to Jeff Vaughn for the heads-up. They get it. An Amarillo TX radio station says bikeshare and e-scooters are great, but where are the bike lanes to support them? They get it, too. After a bicyclist was killed, the Houston Chronicle questions why the city continues to build unsafe streets. A Pennsylvania Home Depot gave a new bike to one of their employees after his was stolen; the local police department also pitched in $800 to help the 21-year old autistic man get a new Trek. Actor Justin Theroux is one of us, as the paparazzi caught him riding his bike in New York’s East Village. Rent a Baltimore apartment, and get a new bike instead of a parking space. An Ottawa letter writer says yes, we need to get more people on bicycles, but calls a new bicycle intersection as useless as Captain Hook’s other glove. A Prince Edward Island man showed his 19-year old daughter some tough love, calling the police after she failed to return a bicycle she’d taken from his home without permission, in hopes it would force her to get help for her drug addiction. No bias here. After an English bike rider gave police bike cam video of a dangerous pass, they responded with a ticket. For him. A British lord, who previously claimed — without evidence — that bike lanes cause pollution is now calling for licensing and insuring bicyclists. That’s more like it. An Irish hit-and-run driver got five years behind bars for seriously injuring a bike rider while driving without a license. An Irish official had to apologize for comparing bicyclists to Nazis, saying he’s one himself. A cyclist, that is, not a Nazi. Why pay to ride indoors, when you can turn a profit by using your stationary bike as an artisanal, organic cocoa grinder, like this one in the Ivory Coast. Once again, a bike rider is a hero, as a South African man used his bicycle to save a young boy from a pair of rampaging Rottweilers. Here’s another one for your bike bucket list: Shredding Indonesia’s smallest and most secluded bike park. A Singaporean writer bemoans the death of dockless bikeshare in the island city-state, following the collapse of Chinese bikeshare providers. USA Cycling is establishing a fund to honor 23-year old pro cyclist and Olympic medalist Kelly Catlin, who took her own life earlier this month; family members have donated her brain for study to determine if a recent concussion could have caused her rapid descent into depression. Family and friends remember Tate Meintjes, calling his death a huge loss, after the 19-year old cyclist was killed preparing for the Redlands Classic. Paralyzed German track cyclist Kristina Vogel now has her own doll as part of Mattel’s Shero program. Road.cc offers highlights of pissed-off cyclists in the pro peloton. 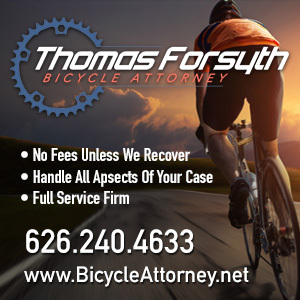 If you’re going to fake a bike wreck and claim a driver hit you, try to make sure there aren’t any witnesses. This is why you don’t casually stroll across a bike race. And apparently, turkeys have learned how to cork. Thanks to Megan Lynch for that last link. Thanks to Margaret W and John L for their generous donations to support this site. Or maybe for my new knee. The turkey “corking” the road was a tom escorting a bunch of hens. Apparently turkeys have harems.